WEST ORANGE, N.J. – Though much of Vizcaya’s appeal lies in the incredible amenities and services residents can enjoy just a few hundred feet from their front doors, there is also a great deal to do just outside of the community’s gates. Festivals, art exhibits, theatrical performances, wine tastings, golf outings, sporting events and scholarly lectures are just a few of the many recreational and cultural opportunities available in the West Orange area. Now it will be even easier for Vizcaya residents to take advantage of those events, thanks to a new events calendar being published by the community’s concierge service. Published by Chapman Concierge, the first issue of the new events calendar will cover events held in October and will be distributed to residents in the last week of September. It will include several child-friendly activity suggestions for those residents who are looking for things to do with their children or grandchildren. The monthly events calendar will complement the more extensive quarterly newsletter Chapman Concierge already produces for Vizcaya residents. The monthly events calendar is, indeed, an extension of the concierge service all residents at Vizcaya enjoy. Lead Concierge Frank Gramo and his staff stay informed about all local events. Residents can contact the concierge for more information on a specific event or to arrange to obtain tickets. Vizcaya residents can enjoy musical theatre at the nearby Paper Mill Playhouse, upscale shopping at the Short Hills Mall and child-friendly entertainment at the Turtle Back Zoo. Several fine dining options, such as The Manor, are within a 10-minute drive of the community. The newsletter keeps residents informed about all of those establishments as well as seasonal events such as the West Orange Farmers Market and the Montclair Film Festival. Located in one of the most charming residential areas in the state, Vizcaya offers home buyers the experience of living in a country estate right in the heart of suburban Essex County. The main building rises majestically above a tree-lined ridge top, offering sweeping views of the horizon. The impressive, European-inspired architecture combines modern interior spaces and old world charm. The building incorporates a traditional stone façade with gleaming white trim, stylish railings, elegant dormers and rows of bay windows. Four distinct home types are available. Penthouses with three bedrooms, 3.5 baths and over 3,200 square feet of living space are priced from $1.5 million. Three-bedroom, 3.5 bath Maisonettes with 3,237 square feet of living space are priced from the $900,000s. Residences with two to three bedrooms, 2.5-3 baths and up to 2,662 square feet of living space are priced from the mid $800,000s. Four-bedroom, 3.5-bath Townhomes with 2,895 square feet of living space are priced from $749,990. All homeowners enjoy interior spaces with richly-appointed great rooms, gourmet kitchens and exceptional master-suites. 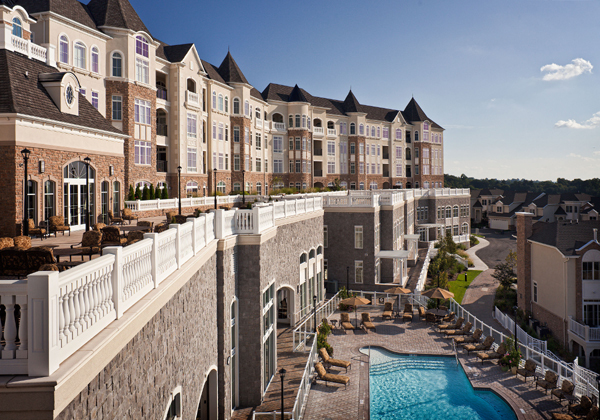 All residents of Vizcaya enjoy unparalleled amenities and white glove services. Popular amenities include a sauna, steam room, massage rooms, fitness center, yoga/aerobics room, tennis court and heated indoor and outdoor pools. Residents also enjoy 24-hour access to a concierge, gated security and valet parking. Residents who choose to travel frequently or leave for the winter can enjoy a stress-free vacation knowing that their home will be safe and the concierge is only a phone call away if they need anything. Vizcaya’s location is convenient. Manhattan is a short, 30-minute car ride away, while New Jersey Transit rail stations are nearby in Millburn and South Orange. For more information or to schedule a tour, please call (973) 325-6712 or visit Vizcaya’s website at www.vizcayanj.com. The Sales Center is open daily by appointment from 11 a.m. to 5 p.m., six days a week (closed on Thursday).